I am a self-professed, habitually recovering people pleaser. As much as I want to march to the beat of my own drum, dance like nobody’s watching, and exemplify all of the other attractive clichés that confident, self-actualized individuals radiate, the truth, deep down, is that I care what people think about me—and I care what they think about my S’mores Brownie Bites. Though I’ve certainly become much more comfortable with myself since high school and college—I find exactly zero embarrassment professing that my favorite TV show is a 1990s political drama, for example—if I am honest, I spend too much time worrying about what people think of me. I’ve spent a good time thinking about this topic of thinking about what people think of me (say that five times fast), and here is what I’ve decided thus far. If I am “nice” enough. I am pretty nice. Most of the time. After coffee. What I wear. Seriously, why do I spend so much time obsessing what to pack on vacation or wear to social events? If I’m funny. I’ll never be Tina Fey, but I can still giggle with my fellow pun lovers and alliteration abusers—you are my people! If I am a good person. Separate of my wardrobe and sense of humor, I care deeply about following a moral compass, and I hope my actions quietly demonstrate that more often than not. If I am professional and respectful. If I bake a killer pan of brownies—because, quite frankly, I do. While I would never post a recipe here I didn’t truly believe in, I can’t realistically expect everyone to fall in love with everything that I make, with the important exception of my brownies. I have yet to have someone take a bite of a brownie I’ve baked and not instantly respond with some combination of a guttural MMMMMM, recipe demand, and/or marriage proposal. I’ve become a brownie narcissist, and now I want you to love my brownies too! This S’mores Brownie Bite recipe is based on the classic pan of brownies I make most often, these fabulous and ultra easy One Bowl Brownies. I tweaked the recipe to make it appropriate for mini-sized baking, so I can’t vouch for how the s’mores brownies would bake in a larger pan, but honestly, this recipe is worth investing in a mini muffin tin. 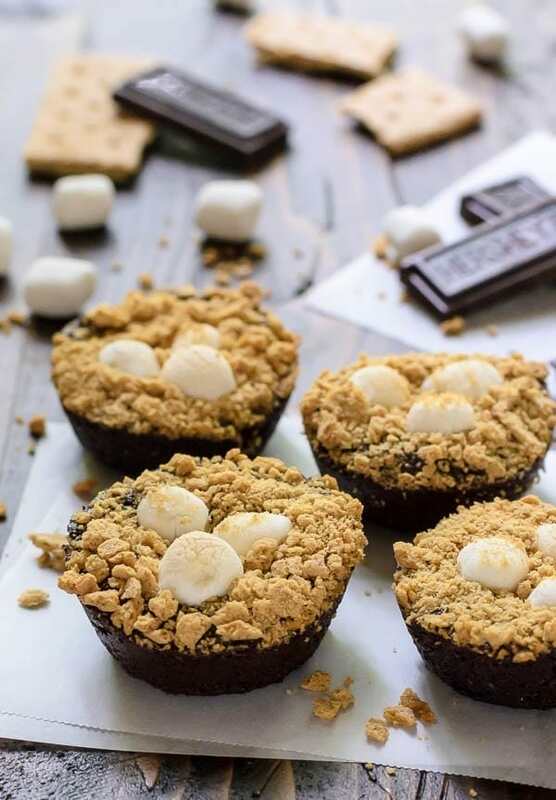 Theses S’mores Brownie Bites are deep, dark, lightly crispy on the outside, and gooey on the inside. Corner brownie lovers will be especially pleased, since the mini muffin tin ensures the “edge” goes all the way around. Middle lovers, fear not—the edge isn’t as thick as it would be in a classic pan of brownies, so you’ll enjoy these brownie bites too. To give these mini brownies a special summer vibe, I turned them into baby s’mores. Each scoop of batter has a few mini marshmallows pressed into the center and a dusting of graham cracker crumbs on top. In the oven, the marshmallows puff and become lightly toasted, and the graham crackers add a subtle crunch. It’s full-on s’mores flavor, no campfire required. And since I’ve admitted to caring what people think on this particular topic: I submitted these s’mores brownies for approval at the pig roast Ben and I attended on the Fourth of July. As my empty container will attest, the people were pleased. Dark and decadent mini brownies filled with toasty marshmallows and sprinkled with graham cracker crumbs. All the flavors of classic s’mores, no campfire required! Find the recipe directions on Imperial Sugar website, where I'm excited to be sharing it. Thank you! I’m sharing this post in partnership with Imperial Sugar. As always, all opinions are my own and thanks for supporting the brands that allow me to continue creating quality content for you! I’d love to be at any party or cook out that you brought these too! I love Brownies and S’mores! Oh and I totally know what you feel like…. I’m always going back and forth between “what do others think of me” and “I don’t care, I want to march to my own drum and be happy”. You have to live life on you own terms and do what you think is the best thing to do, not worry about others. Easier said than done, I know. I just turned down a promotion that I used to think I wanted so badly, and it turns out, I think other people wanted it for me. I want to have more time to spend on my own, working on myself. But these are not simple choices. Making amazing brownies is definitely a consideration, though. If you can do that, then forget what everyone else thinks! :) And these look SO good, Erin! Mir, what a big decision! Thank you for sharing that. I hope it leads to all good things for you. You sound confident and excited, which is fantastic. Good for you! These bites look awesome! And cheers to doing what’s best for YOU :) Pinning! Such a fantastic post! If one more person asks me when (not if) I’m having babies, I’m going to smash these smore’s brownies in their face! Nope, scratch that. There’s no need to waste these beauties! Those list of attributes really are the important ones (especially the brownie one). I’ll take a few of these, thank you. I’ve been making s’mores on the grill with slices of French bread because graham crackers aren’t my favorite. But I think I’ll have to try your marriage of brownie and s’more! Made these tonight! Perfect chocolate-y bite…rich and delicious!! Nicole, I’m so excited to hear this!! Thanks for trying the recipe and letting me know. Have a great day and enjoy every bite! Yummy!! These look amazing girl!! Approved by me! I have been having a persistent s’more craving for the last month or so and then this popped into my inbox. I will definitely be trying these ASAP!! Thanks for another great recipe. What an adorable and delicious looking summer treat! This has my family’s names written all over it. Brownies + s’mores = YUM. I’ve made these several times with and without the s’mores topping (graham cracker & marshmallows) and they are gone with days! This is my go-to recipe for mini brownies. Thank you for sharing! Angie, I’m so happy to hear this, thank you! For what it’s worth, I like you just from reading this post. Your “worth caring about” list is right on and what i care about as well. And this is the s’mores bites recipe I’ve been looking for! Can’t wait to make them for girls’ night this weekend. Deborah, this comment made my night! We sound like kindred spirits :) Hope you and your girlfriends love these! I’m so excited to hear how much you loved this Sandy! Enjoy every bite and have a great weekend! Can you use boxed (I know GASP) the horror!) brownie mix? Hi Stephanie, I haven’t tried it myself, but you certainly can! I hope you enjoy.